DUBLIN, Va. — Volvo Trucks North America introduced a redesigned version of its VNL-series over-the-road tractor designed to improve the truck’s fuel efficiency and performance, as well as driver comfort. “We didn’t just step into the future — we leapt,” VTNA President Goran Nyberg said. He made the comments July 10 during a media presentation to unveil the truck at Volvo’s new customer center here. The VNL gets Volvo’s 13-liter D13 engine as standard equipment, while day cab and VNL 400 models can be equipped with the 11-liter Volvo D11 as an option. Both the Volvo D11 and D13 engines feature Volvo’s patented wave pistons, a design that helps burn fuel more efficiently while being delivered via a proven common rail fuel system with proprietary features that improve fuel delivery precision, cut weight and reduce noise, the company said. The 15-liter Cummins X15 also is available in the VNL series. For model year 2019, the VNL will add a D13 Turbo Compound engine, which uses a mechanical waste heat recovery system to capture wasted energy from the engine’s exhaust. The result is an additional 50 horsepower fed back to the crankshaft and an improvement in fuel efficiency for the engine of up to 6.5%. The engine will debut in 2018, John Moore, Volvo Trucks product marketing manager for powertrain, told reporters July 11. The truck’s redesigned, wind tunnel-tested exterior better controls airflow around the truck and trailer, which Volvo said also improves fuel efficiency. 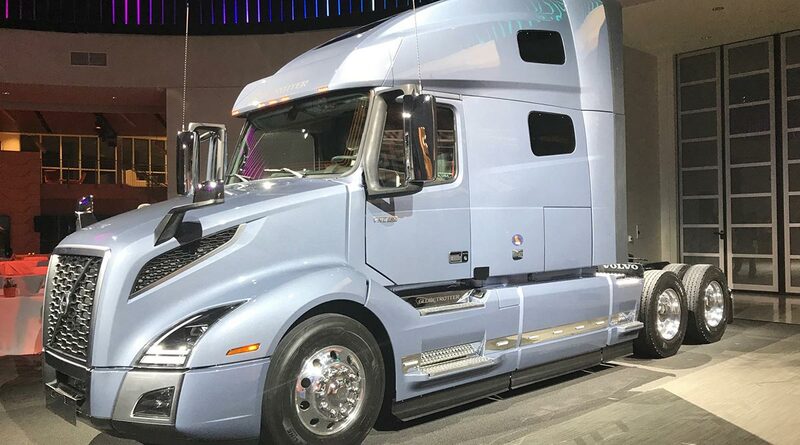 These design cues add another 1% in fuel efficiency and combined with the D13 Turbo Compound help a properly equipped VNL deliver up to a 7.5% increase in fuel efficiency when compared with a 2015 VNL model equipped with a GHG 2014 D13 engine, Volvo said. All VNL series tractors come standard with the company’s I-Shift automated manual transmission. The trucks also come standard with the company’s remote diagnostics telematics hardware, which provides connectivity for engine monitoring and diagnostics. The hardware also permits users to perform over-the-air powertrain software and parameter updates. While these updates can be done from the road, the truck must be parked for them to be completed. The VNL also gets Volvo’s Active Driver Assist by Bendix, a camera and radar-based system that combines forward collision mitigation warnings and active braking. It features a heads-up windshield display that warns drivers if the truck is approaching objects in front of it too quickly. If no driver action is taken, the system can automatically apply the truck’s brakes, Volvo said. The truck will be available with four sleeper configurations, including an all-new 70-inch berth, the company said. For the first time in North America, Volvo’s Globetrotter trim levels will be available on the VNL 760 and VNL 860 high-roof sleeper models. The Globetrotter trim levels include a full aerodynamic package, polished wheels, upgraded seating, a refrigerator, inverter and a parking cooler package, Volvo said. The lineup also includes the VNL 300 day cab, VNL 400 flat-roof sleeper and VNL 740 midroof sleeper. Product marketing manager Jason Spence said input from drivers guided designers during development of the truck.